We are facing a crisis in America. The crisis is largely hidden from view, but like a cancer, it threatens the very health of society. We have become a superpower of incarceration. Today we warehouse 2.2 million inmates according to the most recent U.S. Bureau of Justice Statistics report. That’s more than the entire population of Houston. More than two-thirds that of Chicago. China, with more than four times the U.S. population, is a distant second with 1.5 million inmates. The United States imprisons 760 people per 100,000. The number for France is 96, Germany 90, and Japan 63. As an NAACP advertisement points out, we are 5 percent of the world’s population and we house 25 percent of the world’s prisoners. How did we get here? Between 1925 and 1972, our state inmate population increased 105 percent—roughly proportionate to the country’s overall growth. Since 1973, when stiffer sentencing came in—particularly the so-called Rockefeller drug laws providing lengthy minimum sentences for possession of small quantities of banned substances—the number of prisoners has increased more than 700 percent. That’s about 14 times the country’s overall growth. The costs are staggering. In a survey of 40 participating states, the Vera Institute of Justice concluded that U.S. taxpayers were shouldering an annual bill of $39 billion. And that’s just the direct costs. Indirect costs, which tend to be carried by government agencies other than corrections departments, are incalculable. "The system is so skewed," laments Bob DeSena, executive director of Council For Unity, an anti-gang initiative headquartered in New York City. "As a society we are completely focused on punishment. People are willing to spend hundreds of thousands on incarceration, but they don’t want to spend a few dollars on programs that are proven to prevent them from becoming criminals in the first place." What to do with criminals—what warrants imprisonment, for how long, and how to reintegrate released men and women—is one of society’s most difficult challenges. In modern times, the great philosophical debate has been whether the mission is to reform or to punish. And possibly no society has cycled quite so widely between the two extremes as America. The prison reform movement started more than 200 years ago, in the throes of the Industrial Revolution when a surge in the urban population came with a steep rise in crime. At the time, jail was little more than a means of segregating malefactors from the rest of the population. Perpetrators who weren’t killed outright (Pennsylvania, the first state to outlaw capital punishment for theft, didn’t do so until 1786) were dealt with harshly, confined in dungeons or tawdry, violent, and often disease-ridden jails. One early attempt at reform was nearly as harsh as the system it replaced. New York’s Auburn Prison, built in 1816, was governed by the then-radical notion that prisoners were capable of change. Hence, prisoners were put to work, and community activity was encouraged during the day. But strict silence was enforced at all times, and prisoners were isolated in solitary confinement at night. Prisoners who so much as broke the silence were flogged or hung by their wrists or had their heads locked in iron cages. A grander vision of prison reform would be instituted a few years later at Philadelphia’s Eastern State Penitentiary, the fruit of the efforts of the Philadelphia Society for Alleviating the Miseries of Public Prisons, founded by a Quaker in 1787. The concept was pure of heart—that the light of God could be discovered in any person, whatever mistakes he may have made in the past. The society preached that prison should be a place of penitence where inmates reflected on their sins. In short, a penitentiary rather than a house of punishment. 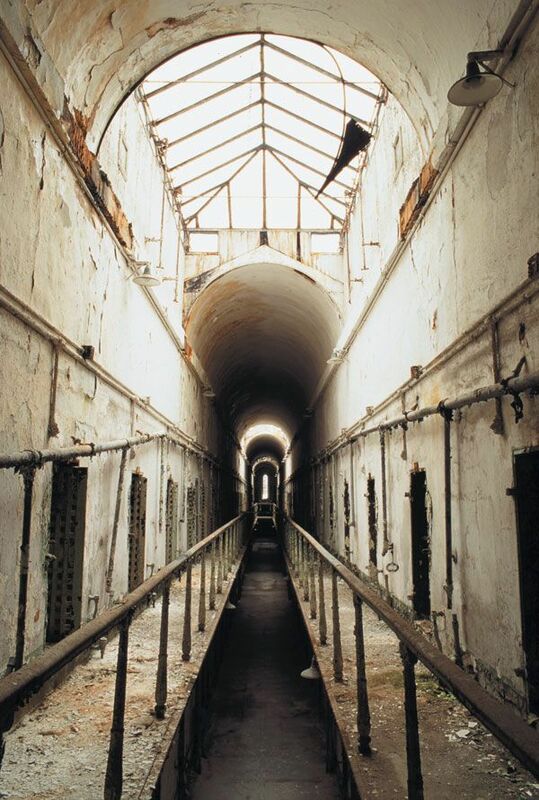 When Eastern State Penitentiary opened in 1829, visitors from around the world marveled at its grand architecture and radical philosophy. With its high arched cathedral and more than 1,000 skylights, the building feels more like a religious space than a prison. When Eastern State finally opened its doors in 1829, the world took notice. Such notables as Charles Dickens and Alexis de Tocqueville came from abroad to tour the facilities. France, Prussia, Brazil, and England, among others, sent representatives. The prison’s design and approach to incarceration would ultimately influence more than 300 prisons worldwide, among them, facilities in China, Mexico, Canada, Czechoslovakia, and Japan—many still active today. Recently I visited Eastern State, which was closed in 1971 but still stands as a museum. It is an awesome and fearful sight—a testament to the notion that man’s noblest intentions sometimes produce the most dismal results. The walls, 8 feet thick at the base, soar 30 feet high, a stack of soot-stained concrete blocks running for half a mile on each of four sides. The interior was designed to include church-like features, such as barrel-vaulted corridors, pointed-arch windows, and skylights to let in the light of heaven. Each cell was a self-contained unit. Within 18-inch-thick walls, a prisoner had a bed, a desk, a skylight, and a small, adjacent courtyard for the time allowed to exercise. Prisoners had flushing toilets, running water, and central heating, the first time such amenities were included in a building of that size, though the purpose wasn’t creature comfort but isolation. The isolation was total. Prisoners received no visits from friends or family and reading material was restricted to the Bible. They could work at one of two productive tasks as either shoemakers or weavers. The cost alone indicates how seriously the prison was regarded: $770,000 spent by the Commonwealth of Pennsylvania on construction made it the country’s second most expensive building after the U.S. Capitol. Measured in today’s dollars, it would amount to more than $11.5 billion. The system, its builders believed, would produce honest men, and supporters argued they were taking a humane and society-improving approach. In practice, it was a living hell. In 1841, when Charles Dickens came to see the extraordinary institution, he met Charles Langenheimer, an immigrant incarcerated for theft. Dickens expected to be uplifted by the experience. Instead, as he recounted in American Notes, he was horrified. "There was a German, sentenced to five years’ imprisonment for larceny. … He had painted every inch of the walls and ceiling quite beautifully. He had laid out the few feet of ground, behind, with exquisite neatness, and had made a little bed in the centre, that looked, by-the-bye, like a grave. The taste and ingenuity he had displayed in everything were most extraordinary; and yet a more dejected, heart-broken, wretched creature, it would be difficult to imagine. I never saw such a picture of forlorn affliction and distress of mind. My heart bled for him; and when the tears ran down his cheeks, and he took one of the visitors aside, to ask, with his trembling hands nervously clutching at his coat to detain him, whether there was no hope of his dismal sentence being commuted, the spectacle was really too painful to witness. I never saw or heard of any kind of misery that impressed me more than the wretchedness of this man." Alexis de Tocqueville and Gustave de Beaumont, reporting back to the French government, interviewed prisoners and also wrote tales of abject misery. "No. 85.—Has been here two months; convicted of theft. Health good, but his mind seems to be very agitated. If you speak of his wife and child he weeps bitterly." Other records tell of prisoners banging their heads on walls until they caused open wounds. "The effects of solitary were brutal," says Norman Johnston, author of Eastern State Penitentiary: Crucible of Good Intentions. "To be cut off from human contact like that is just horrific." However, Johnston points out that almost 200 years later prisons really haven’t gotten much better. Johnston says he has been visiting prisons all over the world since the 1950s. "I’m not sure anything works all that well. 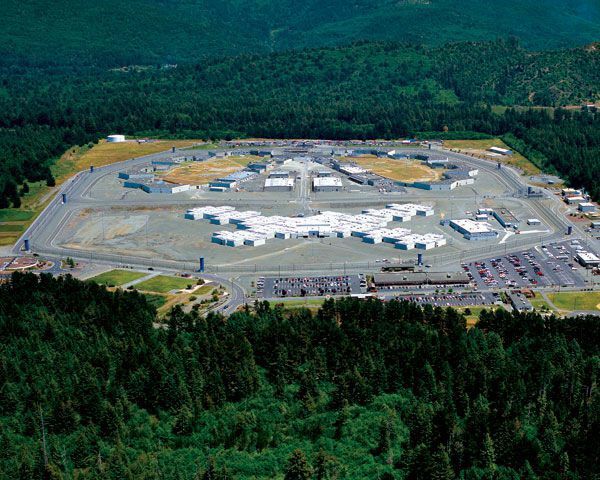 The new, factory-style supermax prisons are built with efficiency, not rehabilitation or prisoner sanity as a prime objective." Will we ever get prisons right? Filmmaker Tony Heriza, who spent two years visiting Pennsylvania’s Graterford Prison, the nation’s fourth-largest supermax facility, documented the early years of an ongoing endeavor in which inmates collaborated in the planning, design, and creation of public art for Philadelphia’s Mural Arts Program. "They became engaged in a creative, collaborative process," says Heriza, whose film, Concrete, Steel & Paint, has been screened nationwide. "There was also an inside-outside part. Instead of just being isolated and warehoused, they could be productive and visible. These programs, like repairing wheelchairs or training seeing-eye dogs, gives people purpose. It allows them to reconnect with people, and that pushes them to be more self-reflective. You can engage them so they understand the harm they did and give them an opportunity to do some direct or indirect restitution. It’s good not just for people behind bars but for their families and all the lives they touch." Throughout the legal and criminal justice world, which includes the professionals who have seen the system continue to fail, there is growing receptivity to the idea of restorative justice—the idea that the criminal justice system has to be predicated on healing and reparation rather than punishment. The notion hearkens back to the ideals of Eastern State’s founders—but without the torture of solitary confinement. Just ask Bob DeSena of the Council For Unity: "The public thinks that people in prisons are congenital criminals and they think society would be better served by hiring more police and building more cells rather than create programs that would change the dynamic. Yes, there are psychos in prison. But there are also people that could be running companies instead of being in prison." Council for Unity organizes incarcerated former gang leaders and gets them together to talk. It’s all voluntary. They sit in a circle and speak freely about their sins and their regrets in a program modeled on AA. "We bring in FBI and Department of Corrections and community stakeholders," says DeSena, "and they are stunned by the intelligence and depth and squandered assets of young men who should not be in prison." He argues that the first step in reform is not seeing prisons in isolation but as part of a social system. "We need to recognize that from the moment someone enters prison he needs to be prepared for when he leaves prison. You can’t neglect him for 20 years and have him walk out with $78 and a bus ticket and expect him to function in society." DeSena has supporters within and without the system. Sheriff Vincent DeMarco, the warden of Suffolk Jail, recalls his initial skepticism toward DeSena’s proposal to create gang powwows in his prison. "I was like, ‘Who is the guy, what does he want?’ It sounded bogus." But as DeMarco listened, it began to make sense. "After 20 minutes, I was hooked," he says. Today, an anti-gang program is running in DeMarco’s jail. "Gang members join voluntarily. They find out that they have more in common than they have different. They are great leaders," says DeMarco. Granted, DeSena’s organization has made but a tiny inroad into the gigantic problem of incarceration today. As he points out, what’s needed is a comprehensive reform effort at the government level. "There have to be programs through unions or through tax breaks to corporations for apprenticeships and job placements for offenders. They need halfway houses and wraparound services that include job placement, career readiness, housing, substance abuse services, all the things an offender needs in a communal setting in place before you even let him go. If that happens, he’ll have a place to go, and he’ll have enough here that he doesn’t have to go back there." The recidivism DeSena talks about is precisely the problem. It’s widely acknowledged that without programs to lead convicts back to a place in society, we will never cure our nation of its incarceration problem. As a cautionary tale, consider Dickens’ German prisoner, Charles Langenheimer. Released from Eastern State a few years after his encounter with the famous writer, the incorrigible thief would be arrested and jailed at least a dozen more times, serving eight more sentences at Eastern State alone. Finally, in 1884, desperate, frail, and unable to function on the outside, Langenheimer returned to Eastern State and asked if he could be let back in. He said he wished to die in the one place he had successfully adapted to. Prison officials granted his request.